1 passes to 2 and follows pass; 2 passes to 3 and follows pass; 3 passes to 4 and follows pass; 4 dribbles and shots then runs to where 1 started. Rotation will mean all players have a go at shooting. Blues then take a turn. 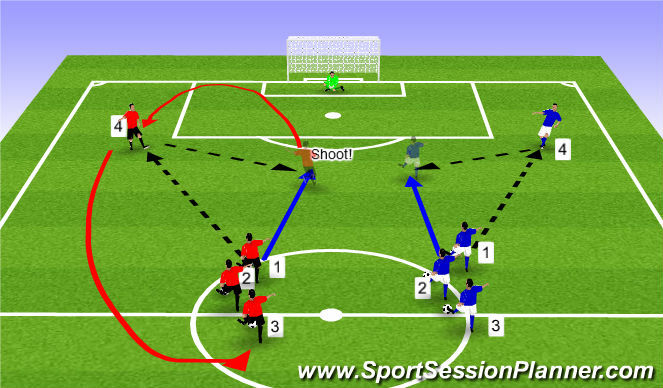 Variation - Passing starts from Goalkeeper; Shooter has 2 touches; shoot from outside the area; shoot from inside the area; Change the cones to have a passing pattern you would like team to use in a match. 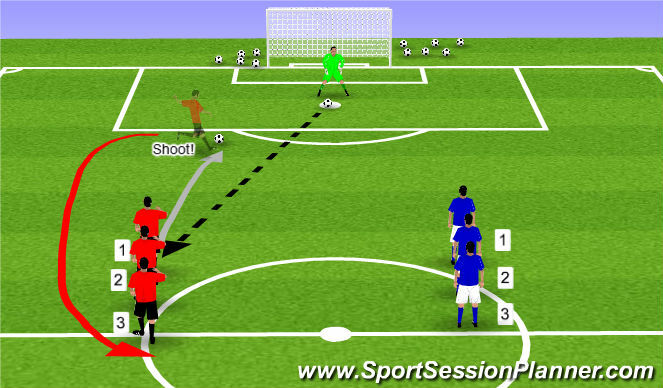 GK passes to Red 1, who dribbles and shoots. 1 then goes to back of the line. GK gets next ball and passes to Blue 1. Blues and Reds take alternate turns. Be aware of too many players will mean they are standing in line.